Now, you are »ready to swing into.ACTION. Assuming you, dear, readers, to be the Mentalist.-perfprmer, contact your newspaper men. One .or more men will be assigned to cover the story and accompany you. With your manager, reporter, and any others,, the first step is to phone the Mayor for a convenient time for the original interview. Once arranged, appear on schedule at the Mayor's office with your entourage. After formal introductions, you (or your manager) appraise ..the Mayor of the fact that you have recorded a prophecy of the most important local and international event that will appear in the_.DAILY BLAT on__ak_giyen_date-j~ that you prepared the prophecy in the secrecy of your hotel room, and that no other eyes have seen what you have recorded. You withdraw the paper, folded into a small square (so as to fit snugly into the aspirin tin), which you place on the Mayor's desk, and ack hi:a to identify the prediction by placing his signature on the outside of the packet. The Mayor is given a small 100 variety aspirin tin. He is asked to open it and to secretly scratch some identifying marks on the interior of the box and to not impart that knowledge to another living soul. The Mayor places the prophecy in the box and snaps it shut. The manager produces a thin length of wire, and securely seals the box. At this point, the first bit of trickery enters the routine. The men-talist's manager has in his right coat pocket a duplicate aspirin box, containing a blank piece of folded paper. The box is closed, and sealed with vire in an identical manner as the original. The wire must be the same kind and length, and wound on the box in identical manner. This is easily accomplished, as either the Mentalist or the Manager wire the original box. Understand - at this point - the committee know nothing of the procedure-are caught short. They suspect nothing because of such positive identification. Just as the wiring of the first box is complete, the aspirin box is allowed to remain on the desk or table top for a few seconds. With perfect timing, the performer DROPS the tin Bisodol box on the table top. Performer unwinds a length of wire from a spool taken from the pocket turning to his manager, and inquires if he has the scissors. Manager who is now holding the aspirin tin, goes with it into his right coat pocket and withdraws the small scissors, WITH the duirmy box, leaving the original box In pocket, The move is extremely bold and cold-blodded, but with timing, works - like a charm. Without any break or interruption, mentalist cuts the wire, gestures to the Mayor to put the aspirin box pronptly on table top as manager uses the scissors to cut the wire, held by the mentalist. The switch is easily and neatly executed. This time, the Mayor Is asked to seal the box with the wire, and of course, it makes no difference HOW he sr.als it. As your manager has the original aspirin box - with the secret INNER mark and the blank paper bearing the Mayor's signature, you are all r:et. It is necessary to follow thru the phases of having the bread baked, and to see that the spectators don't prematurely open the boxes for a 'preview'. They are allowed to place identifying marks on the OUTSIDE of the larger box - which prevents them from placing any marks on the inner box - in a moment when you are not watching - and upset your apple cart. Thus, you have achieved the switch -and protected yourself in the clinches. Get the box away from yourself and manager - Into the careful custody of your committee, who place it in the bread, with identifying items, etc. As a further precaution-, it is suggested some identifying object be placed PARTIALLY in the bread - so that no possible slip could occur in the bakery, and you get the wrong loaf. The x-ray, of course, prevents that possibility, but it would be AWKWARD-if somehovr the loaves were mixed! ^entailstarid -mana^r can^ lmva .dupliciita boxes ,_,_either <>ne making "the - switch. This bit o'-f skullduggery may seem a bit of a let-down to some of my brilliant"' readers - but since the day of REAL miracles is not at hand, there' a trick someplace. But - let's hesitate and analyze. WHO and why would a person even remotely expect or suspect a switch at this point of the game. Why, oh, WHY? ■ If you wish to really appreciate the fine and truly remarkable points • of showmanship in this great routine - just pause - and answer the above questions NOW . Recall, the aspirin box contains the prophecy bearing the Mayor's signature, and inside secret mark known only to HIM. Why switch it. When a fair committee must actually remove it from the bread - and in the manner previously described in the effect? At any rate it IC switched, and you have all you need to successfully complete the prophecy. Surely, invite the Mayor to accompany you to the bakery - to follow thru each step, ' He would look fine in the picture of the baking of the bread. Off to the bakery with the official party. Mayor or reporter carrying the duplicate box (for safe keeping). With previous arrangements made, the Mayor or bakery superintendent inserts the prophecy box in a pan of bread dough . Any members of the committee can further identify the bread by inserting a ring, coin, pencil or what not. The dough goes into the oven. Committee waits until it is baked and cooled. Committee or reporter escorts the loaf of bread downtown, where it is placed in a transparent lucite box, locked with padlock - sealed. The side and corners are sealed with tape, bearing the signatures of reporter, store managers, etc., to prevent any hocus pocus. The window is properly arranged with show cards, spot light on the bread, etc. At this point, it may be added that if the mentalist's assistant or manager can carry a flash camera, and take pictures at various points of the procedure, it further impresses the committee of the importance of the affairs! Creates some confusion for the switch and later recollection of, events, and the pictures, may later be developed and used in the store window J Thus, you attain a pictorial and printed story of the actual happenings, which are more vividly impressed upon the public's mind. It remains with your manager and the theatre press agent to see that -the newspaper reporter turns out a good story. Each day a running story -on the MYSTERY of Mr, Blank's PROPHECY. What will happen upon that fateful day that is yet unrevealed? Will the prophecy come true? What does the MYSTERY loaf of bread contain? Pictures of the Mayor signing the prophecy;■■■•' of the baker inserting it in the bread - and the box in the store window are all good. There are countless nfews angles - and each should tell when and where the loaf of bread will be opened and the prediction revealed." As. an extra jpubiicity tie-up, arrange with some store to also 'get iri the act*. Good newspaper tie-up, too. Store contributes a diamond ring, 1 or some premium, which will be given to the (first) person who writes you, guessing the true prediction, This is exceptionally good where a sporting contest is involved. With a baseball game, they would be required to give the box score - prize fight, winner and-exact—time, etc. Many merchants will be glad to contribute a premium or prize for thepublicity. Naturally, the story of the success of the prediction is the headliner. It should recount all the details and precautions against any trickery - and the successful outcome. Two predictions should be given - one of the international note, the other the most prominent local occurrence of the day -and don't forget, PREDICT the stock and bond numbers of the dayI That will set afire the imagination of thousands of people - who will want to see and talk with you. Ad copy should be carried in the theatre's advertisement about the loaf of bread in the window and time it will be opened at the theatre. Arrangements should be made for the bakery to carry a special ad of the baking of the bread (with x-ray picture,) etc.and reference to the whereabouts of the bread (window) and when and where it will be opened. Store will wish to carry copy on their unusual window display. BUT don't leave this to chance. The mentalist's manager should check on these details and see that they are carried out! At this point over half of the work has been done. During the interval until the time the prophecy is to be revealed, it is necessary to see that plenty of publicity is continually released in the papers. The mentalist can only await the fateful time - and get copies of the desired newspaper - and then there is more work to be done. He has the original box by virtue of the switch. He removes the wire, opens the box and removes the folded (apparent) prophecy with the Mayor's signature on the outside. Actually, it is a BLANK piece of paper! He retains the tin aspirin box, and it contains the Mayor's secret mark scratched in the inside. Having obtained the desired newspaper, he THEN writes his prophecy selecting the HEADLINES - and his two most important stores. Just a brief mention of the detailed event - plus the stock and bond numbers - and sign his name. He refolds the paper with the Mayor's signature on the outside, replaces it in the original aspirin box, and with a duplicate piece of wire, seals the box in the same manner as the dummy box (now in the loaf of bread). Now the performer is assured of a box the exact duplicate of the one in the loaf of bread - a duplicate in every detail. It now stands to reason among you who- read these lines over my shoulder as I type that a SECOND transposition must take placel But how to get the original marked box into the bread ? 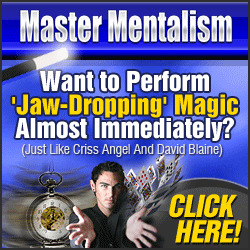 The answer is that the mentalist simply doesn't, nor is he foolish enough to try. That is where the strength of this masterpiece lies - in NOT doing the obvious. Every step of the entire procedure is so carefully covered as to prevent such a means as a switch that the idea will not present itself. Every precaution has been taken, acted upon, been accepted and dismissed as the routine continues. Recall - the Mayor's signature on the paper - he puts it in a tin box which HE secretly -marks INSIDE so no one else will know. That little fact makes the first switch easy - and LOGICAL. The reporter ..or balcer puts-the box in the dough, which is further identified-by a spectator's article, ring, coin, etc. , It is obvious that the box cannot be switched. NOR the bread, NOR.the sealed lucite box-which,later contains the bread. On the stage, the performer NEVER approaches the bread - so there can be no trickery there. Every gentleman is asked upon his word and honor to truthfully identify the paper, box, bread, lucite box, etc. that no one except the Mentalist knows what he wrote on the prophecy. The Mentalist does not tell anyone in advance he will include the stock and bond numbers -this is a big surprise element that catches the imagination of the spectators long after they have, forgotten the headline prediction. These points are driven home forcefully! During the revelation of the prophecy, the performer can truthfully s.tate that he has never once seen or come in contact with the prophecy on which the Mayor placed his signature, nor has he any idea of the identifying marks on the box. He can truthfully make this statement - offer ten thousand dollars reward to any charity if anyone can prove otherwise. THIS SOUNDS VERY GOOD, is worth using. To truthfully dp this, the manager writes the prediction for the mentalist. Standing at a distance from the bread in the transparent box, the performer directs the committee to examine all the seals, etc., and when satisfied, to open the box and remove the bread. To examine the bread for breaks, holes, etc., and when satisfied to carefully place the bread on the glass table. Now - the Mayor, reporter or any prominent member of the committee, which would include several of the original participants and a few spectators from the audience - are directed to very carefully pick the loaf of bread to pieces - bit by bit - carefully examining same for cuts, slits or holes in the .outer crust. - Until they have found the committeeman's identifying object and the prophecy box. The identifying object and prophecy box are passed for examination among the committee, while the performer recounts for the audience the actual procedure of the prediction, and each participant is asked to verify the report. Performer makes continual reference to the tin. box with the prophecy (while in the hands of the committee). Committeeman gives the tin to the Mayor,(or his representative if he is not present) who removes the wire — opens the box - verifies the secret marks - and the Mayor's signature - opens and reads the prediction. Thus the performer has been building to a suitable climax - sustained by suspense in recounting every detail - until the final revelation of the prophecy. A copy of the newspaper should be on hand, given another committee man, for absolute verification of the prediction - STEP BY STEP - for the headlines - first important story - second story - and what's this, the stock, and bond numbers for the final blow off? Here showmanship and a bit of staging are necessary - the mentalist can take his bows and great acclaim - and a final fan-fare from the orchestra. Your author is not going to write the closing remarks, or any of the patter for that matter, as such patter must be patterned to the individ-vial performer and situation - but don't overlook this - the plan to ad lib - at-. least, have the basis of your presentation at the tip of your tongue and advance stage and rehearse your grand finale! Oh, yes, I forgot to tell you how the last bit of this fine chicanery is accomplished. Believe I did mention a second switch! Alright, let's continue logically. The mentalist never goes near the bread, prediction tin or paper on which the prophecy is written. Isn't it quite logical then that one of the committee must do the dirty work? Of course, and quite naturally. You must realize the tremendous force of your continual (and proven) suggestions that no exchange was possible (identification marks, integrity of committee, etc.). Nothing of this sort is looked for, and the element of expectation is great. Your audience is not seeking a solution to the problem NOW -but are held in final expectation of the outcome. Besides the actual participants in the preparations, newsmen, Mayor, bakery employees, store manager, etc. a few prominent spectators are invited from the audience. In this small group is your STOOGE. He must play his part well - neither too well dressed or too prominent -greatly interested and of mild curiosity. He witnesses the removal of the bread - the prediction tin, etc. as do the other theatre spectators. The theatre spectators are only stage WITNESSES until the prediction tin is recovered - at which time the performer recounts the entire proceedings to date -and it is then all spectators get a chance to examine the box. There is an interval of two or three minutes - so no haste is necessary. Just as each item - plastic box, bread, identifying objects are all checked by the committee, likewise this occurs with the Bisodol box when it is located. Positive identification is made. Allow the Mayor to open it - and of course, inside is the smaller aspirin box with the prediction. It is at this point that you get off tempo - recount the actual phases of the prediction. All of the committee waht to see the box, and all your stooge need do is to get his hands on the box for a second. As a committeeman, that is his privilege. All he need do is to reach forward, pick up the box (or take it from another spectator), turn and merely bring the two hands together (exchanging the small easily concealed boxes) and hand the original box to another parson for verification. He should be standing behind other spectators at this time. The mechanics of the switch are extremely simple, as it is .not anticipated and can be done hidden by another. However, this should be carefully practiced. He can take the box, turn to another to show it, and switch. As soon as the switch is made, he should get rid of the original box - getting it into the hands of others, or lay it on the table. It is most obvious the stooge must be well rehearsed in planting the box and making the "switch. This must be rehearsed from several angles and made perfect - however, the exchange of a small aspirin box should be easily accomplished by even the most stupid. The switch here does not present so much of a problem but upon it rests the success of the entire venture. Don't muff it. Thje_ea.rJJ.ex the^xchan£e~c:an-ba.„made, the better. A signal-—-:a clear-ing-o-f the throat or cough can signal the performer—thai^jthe -evil deed has . been done. He. should then ascertain who has the b ox in the .committee and apparently annoyed' at the stupidity of the committee, harshly ask the box t.. be given to the Mayor to open - and continue his summary, down to the.actual identification of the signature, and verification of the prophecy. I believe that it is apparent to all that here is a very clever piece of showmanship. As it's originator, I implore all who attempt it to do so only after the most careful preparation, routining, and-rehersal. It is too good to be mangled by: poor showmanship. THE EFFECT: Three cards, each of a different color, and a small window envelope are shown. The Mentalist states that he will prove his power of receiving thoughts and asks the spectator to merely think of, and concentrate, on one of the colors displayed. Turning his back for a second, the Mentalist places one of the cards in the envelope and places the envelope, windowside down, in frnnt of the spectator, The remaining two cards are placed in the Mentalists pocket. Then the spectator is asked to name the color thought of. The envelope is turned over...there, showing through the window, is the color selected. The other two color cards are removed from the Mentalist's pocket. The card in the envelope removed and the envelope may be examined. THE REQUIREMENTS: Three cards each of a different color (red, blue, and green,) and a small envelope.with a round window cut in the flap side. Also a gimmicked card. This card is constructed in such a manner that any of the colors can be made .to show through the window (See illustration). ..TO PERFORM: Place the gimmicked card in the outer breast pocket of your coat (orf.if you prefer, in your shirt pocket) with the tri-color side nearest body and the green chip towards the floor. The three color cards are placed in the envelope. When ready to perform, remove the cards from the envelope and display them;, demonstrate how, that when a card is placed in the envelope, the color shows, through the window. Now state that you are going to attempt to read the spectator's thoughts. Ask him to concentrate on one of the colors. When he has stated that he is thinking of one of them, turn the envelope on the table so ... that the iwindow is down and on top of the envelope place the cards in the order of GREEN, BLUE, AND .RED, Red being the upermost. Pick up; the stack in the left, hand and turn your back. At this point, when you look at the stack, the window should be facing you. Reachr v±th the right hand,, for the gimmicked card and place it in the envelope in.this manner; The tri-color side facing you with the green chip towards the bottom. Slide the card into the envelope until just the green shows. A slight pressure of the fingers will keep it in this position. Fold down the flap and the right hand now takes the envelope. The three color cards are placed in your left coat pocket with the RED to the outside and GREEN nearest the body. Turn around and place the envelope, window down, on the table. Ask the spectator to name the color he thought of. Before you turn the envelope over, impress upon the spectator that you placed the card in the envelope before you asked him anything and that the envelope has been in full view etc. This is a very strong point, so make the most of it. Ask him what color he thought of and what ever color he names, you are prepared to show him. Since each color varies in the method of showing, we shall take each one separately. 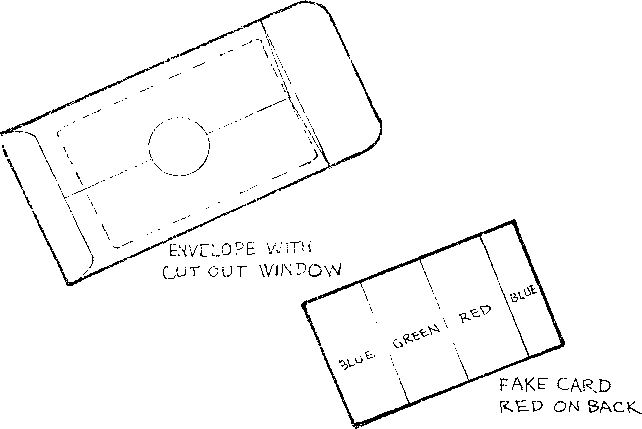 IF RED IS NAMED: Lift envelope by flap end and allow card to slide down in envelope so that RED will show in window. A slight tap will help accomplish this. Turn the envelope over so that spectator may see the Red, Then tur— the window towards you and reach in the envelope and pull out card. (Careful to keep tri-color side towards you. As one side is solid Red and he has seen the other through the window, the spectator will assume that both sides are red. At the same time, reach in coat pocket and bring out the Blue and Green cards (you have them stacked so that you know where each is) and place them with the gimmicked card and then casually place all three in pocket, leaving the envelope for examination. IF BLUETTS. J3AMED : P i ck -op-envelope - witJx^liidow -towards you^ Dpet^ £ lap - aitd—pullr-card up out;_oiLjenvelope so that BLUE shows in the window AND above the top of the envelope. (The flap being up keeps the spectator from seeing, the back of the card). Show, in this position, to the spectator and at the same time reach. In pocket.and bring out over gimmicked. card so that when card is pulled out of envelope top and one edge of blue shows. Cards are put in pocket and envelope left on display. Be careful when pulling card from envelope to keep it tilted at such an angle that spectator doesn't catch glimpse of back of gimmick. TO REPEAT OR NOT to repeat an effect has always been the question. As to "SPECTRA-MENTAL" we can say this: Since GREEN leaves you the least clean (and experimenting by Ed Mellon has shown this to be the least called for color), it would be a good idea to repeat to get a cleaner finish. Ed always repeated the trick a couple of times and then used this for an ending. He would take a small pad and write the colors on separate sheets of paper stating that he would leave this selection to pure chance. Ball the papers up, have a spectator chose one, open it and the name of the color on the paper was the color in the envelope. What Ed actually did was to put a legit card in the envelope (Blue) and when he wrote out the papers would put the same name on them all, Say that he was writing Blue. Crumple paper and place aside. For the other slip he would say Red but would write Blue, crumpling it and placing it aside. Then Green, but write blue and put it along side the others. He would then mix the slips so that everyone lost track of the colors. One was selected and of course that was the color of the card. Needless to say, the other two slips were casually disposed of. (It would be possible to have duplicate slips if you wished to switch). This method allowed all cards and the envelope to be examined throughly. We have here what we think is one of the best book tests in the world, if not the best, ' You can read minds like a book with this miracle. Effect: Spectators select one. of four cloth bound books, or all four if they desire. A word is remembered on a freeiy selected page in one or all of the books. You then reveal each and every word, one at a time by writing it on a slate, showing the word each time before the spectator tells wh&t word he selected, A delighteful. new method and principle makes it a joy to perform. Apparatus; The four cloth bound books we supply and a very special slate, also some chalk. 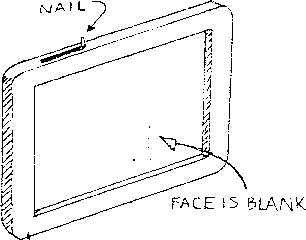 Method and Presentation: Upon examination of the slate you will find a slot in the edge of the slate frame, A nail projects slightly from this slot. Move the nail toward the outer edge cf the frame and almost magically strips of words appear under the usrface of the slate. The number in front of the words indicates the page number. 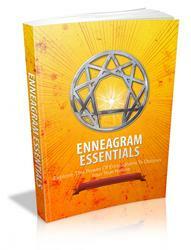 Each book title is in heavy type at the head of the list of words. Presentation: Put the four books on the table and have one or more spectator select one or more of the books. Pick up the slate casually showing it on both sides., the left thumb covering the slot and nail head. (The strips are out of sight, of course). Hold the ungimmicked side of the slate toward the spectators and ask each one who selected a book to give you a number between 10 and 50 or whatever amount of pages the strips encompass. This may vary with each slate depending on the set of books supplied with your slate. As each number is given to you, you write it down on the slate on the ungimmicked side of the slate facing the spectators. Now you instruct the spectators with the books, to open them to the pages they selected. Meanwhile you hold the gimmicked side of the slate toward yourself, secretly pulling the gimmick out so you can see the strips Circle the words on the selected pages and close the gimmick. Pressing on the plastic at the proper place will make it clearer. Turn the gimmick side of the slate toward the spectators (it is now blank) tell spectators to look at the first word on their selected page. You can build it up at this point, because, in most cases, you have not only one, but in some cases, two and three words. Pretend to get the third word by mistake, reprimand them for not concentrating on the first word, then write the first word on the slate, or the two to three. Wipe the chalk off and continue with the other books and spectators. 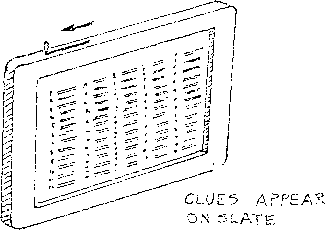 PependdLog-oir -cm-other you look at the strips and skip all around in revealing the correct words, leaving the audience with the impression you can read the whole book. We are sure that with this miracle you will think of many other presentations. Note: The side of the slate with the slot can be removed by taking out the screws and then the inside cardboard gimmick can be removed. In replacing it be sure to put the plastic on top of the cardboard when you replace it in th* frame to prevent tearing of the cardboard.